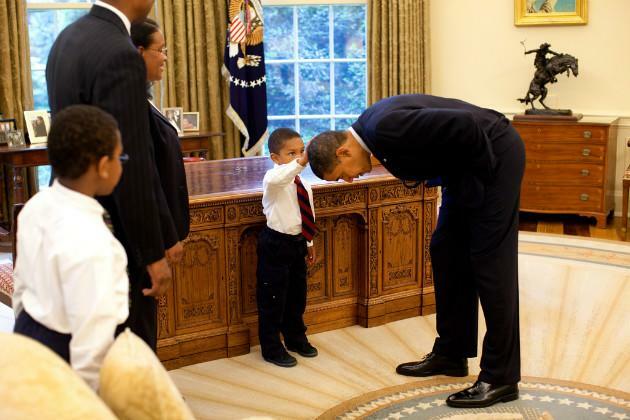 The story behind a photograph showing a 5-year-old black boy touching President Obama's hair may be coming to your inbox soon. The New York Times published the adorable back story about the photo—which has been hanging in the West Wing of the White House for more than three years—on Thursday, and it's quickly become the most-emailed article on the Times' website. In May 2009, the child, Jacob Philadelphia, was visiting the White House with his father, a former Marine who was leaving his 2-year stint working for the National Security Council as part of the White House staff. The father asked to take a family photo with the president. Jacob said he had a question for Obama, who was then in his fifth month in office. "I want to know if my hair is just like yours," he told Mr. Obama, so quietly that the president asked him to speak again. Jacob did, and Mr. Obama replied, "Why don't you touch it and see for yourself?" He lowered his head, level with Jacob, who hesitated. "Touch it, dude!" Mr. Obama said. As Jacob patted the presidential crown, ... [White House photographer Pete] Souza snapped. "So, what do you think?" Mr. Obama asked. "Yes, it does feel the same," Jacob said. As the paper noted, President Obama has largely avoided discussing race during his first term. But the photo "is tangible evidence" that the president "remains a potent symbol for blacks, with a deep reservoir of support." "As a photographer, you know when you have a unique moment," Souza told the Times. "But I didn't realize the extent to which this one would take on a life of its own. That one became an instant favorite of the staff. I think people are struck by the fact that the president of the United States was willing to bend down and let a little boy feel his head."